The initial scenarios were discussed and evaluated in the community sessions and refined until a single concept diagram emerged in June 2007 that incorporated the most promising development features. This concept continued to be evaluated and refined until a final plan emerged in September 2007. 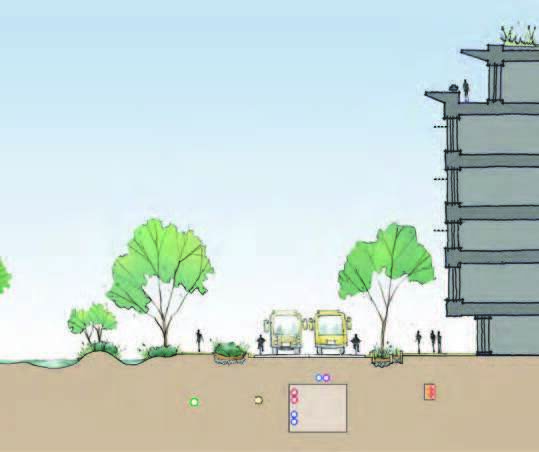 The Concept Diagram illustrates the location and disposition of development on the site at the land planning scale without the specificity of individual building footprints. 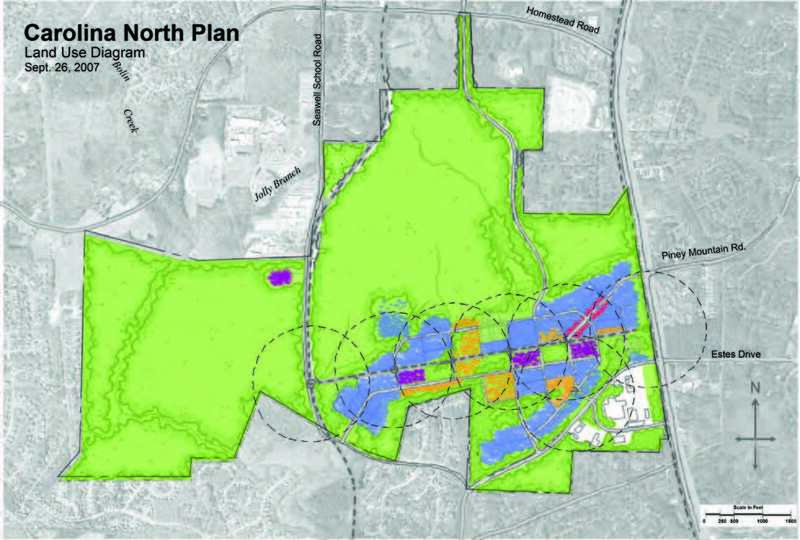 The majority of the development is located on land that has been previously disturbed by the existing airport, historic runways, former Chapel Hill municipal yard, and landfill, thereby preserving a large section of contiguous forest and habitat. This distribution of development focused future development in areas that were identified in the ecological assessment as less suitable for conservation. 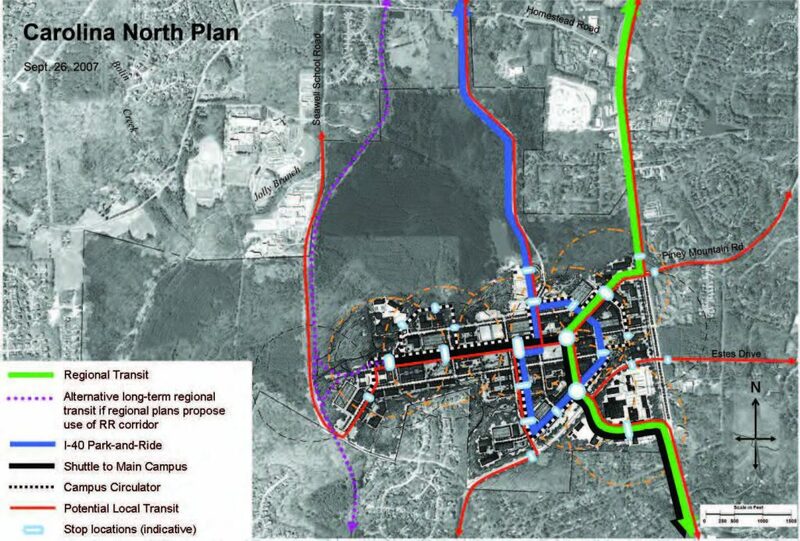 The plan is oriented east-west and integrates blocks that face solar south to optimize future solar gain in buildings. This pattern will allow the incorporation of new technologies as the buildings are designed. The yellow shaded areas in the concept diagram signify the relative density of development – the deeper the shade, the more dense the development. The diagram shows that the most dense development areas are located at the center of the development along the transit corridors. 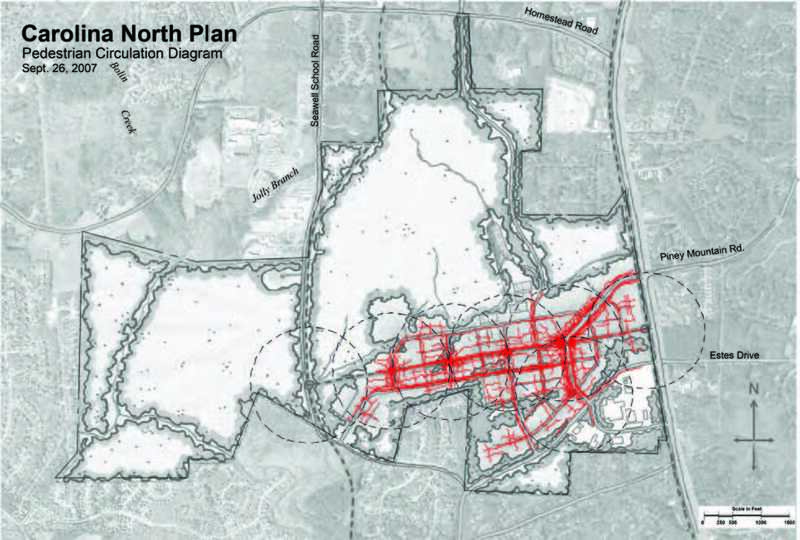 The network of open space is a key feature of the plan. Regular intervals of open space through the center of the development act as organizing elements along the transit corridor and encourage interaction with the landscape. The open space not only provides areas for working landscape to absorb stormwater run-off, but also connects the development back to the beauty of the site. The areas of working landscape (see definition) may include constructed wetlands, geothermal well fields, preserved habitat, and best stormwater management practices, allowing development to flow seamlessly into the natural landscape. Providing regular access to open areas in the most dense areas of development provides an appropriate land-use balance between opportunities for density and livability for the anticipated residents and occupants. 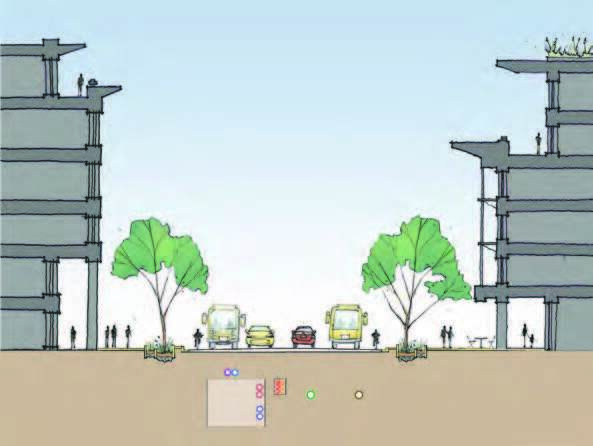 The plan is designed to be pedestrian friendly. One thousand feet is approximately equal to a ten-minute walk and is considered a generally acceptable walking distance in a transit-oriented development. 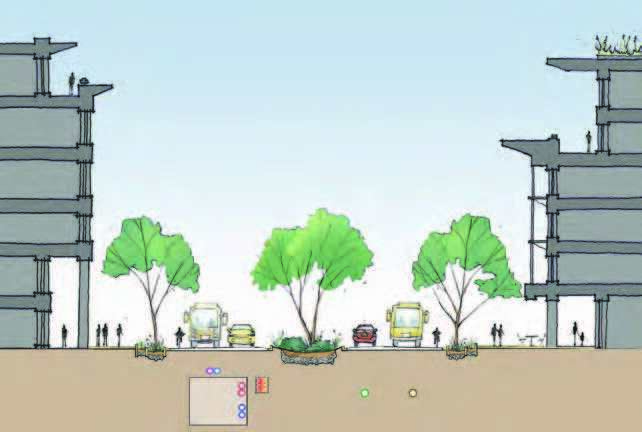 The plan includes transit stops at 1,000 foot intervals and wide sidewalks with full canopy street trees. Pedestrian activity is concentrated along the main entrance road off Martin Luther King Jr. Boulevard and the nodes along the transit corridor. The entrance road is envisioned to have active ground-floor uses including retail businesses and cafes that would attract graduate students, researchers, and employees and serve the residents and visitors at Carolina North. 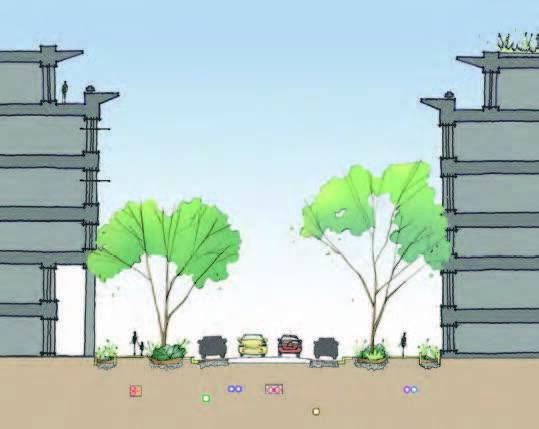 Also acting as a main loop for regional transit, the entrance road will be a natural zone of pedestrian activity. The plan includes an extensive transportation network to achieve connections between local and regional transit. There are provisions for multiple types of transit and flexibility for future improvements and connections. Transit and transportation improvements will necessarily evolve over time, with appropriate commitments phased in as certain densities are achieved. The overall vision includes multiple connections to existing services as well as new services such as an internal campus shuttle that ties into transfer points and moves people through and around the site, reducing the need to drive and park multiple times through-out the day. As the campus grows, additional service to the main campus will reduce the need for car trips between the two locations and help eliminate additional traffic on Martin Luther King Jr. Boulevard. Flexibility to respond to growth and changing technologies is essential in transportation planning. While there are many ways to design transit routes, the following diagram shows one example of how they could be incorporated at Carolina North. The street network and setbacks in the plan allow for changes in transit systems and technologies. The plan anticipates opportunities for the campus to respond to a variety of parking strategies that will evolve as the campus grows. 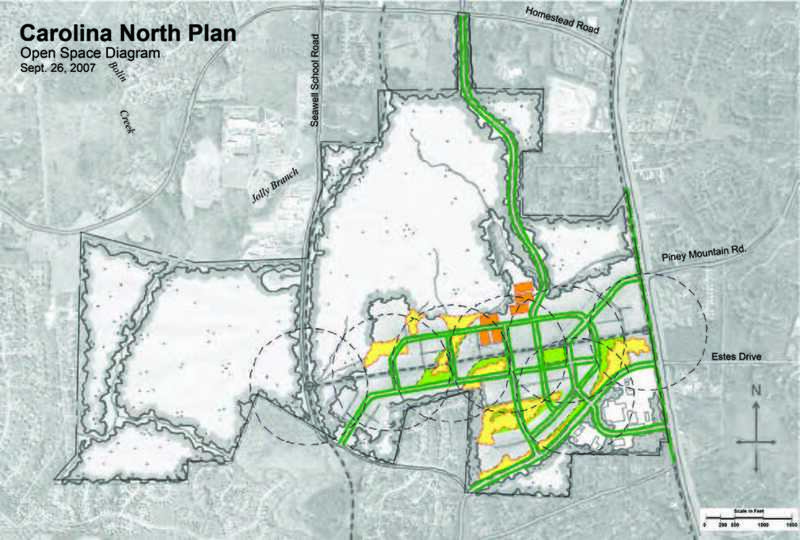 The plan provides opportunities to connect to proposed greenways and bike trails in both the towns of Carrboro and Chapel Hill. These trails will need to be field-located to avoid interrupting the existing for-est patches and natural features as much as possible. Amenities such as a centralized bike service and storage facility and strategically placed showers and storage areas in buildings could also be considered as the campus grows. 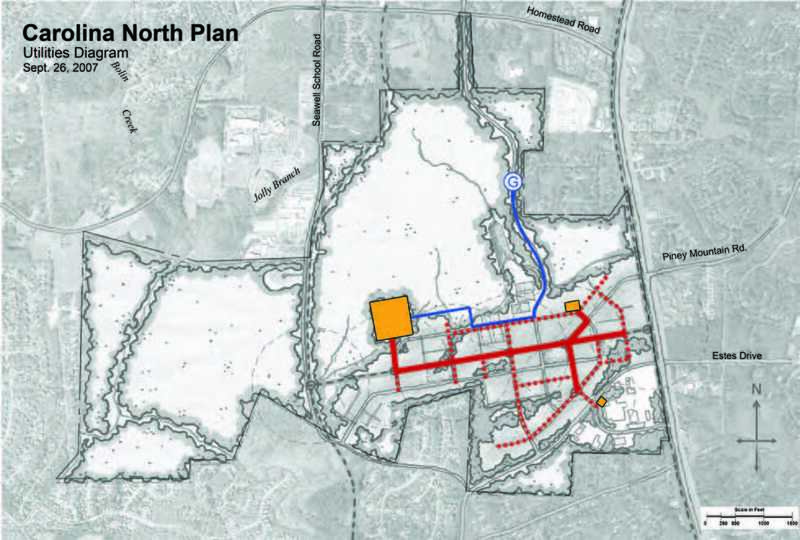 Appropriate and well-designed connections to Carolina North will complement the transportation system, providing additional flexibility in access for occupants and users. 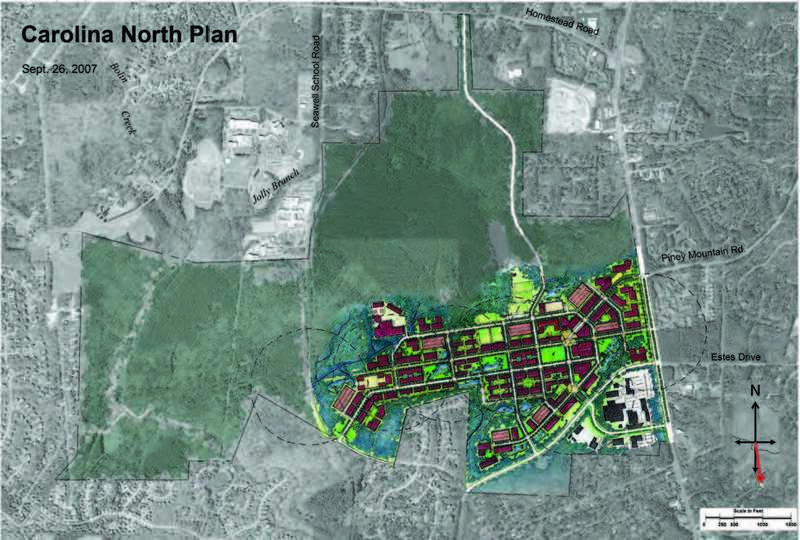 Carolina North is envisioned as a transit-oriented, mixed-use academic campus. Multiple uses across the development allow for a more dynamic environment. On-site residents will help reduce traffic trips and provide 24-hour activity. Housing for graduate students, researchers, and faculty will be located through-out the development, serving as a buffer to established neighborhoods as well as adding an active evening use to the dense core. Ground floor retail to support the development is located along the entrance road and at transit nodes, concentrating these services near the majority of daytime users and within walking distance of residential areas of campus. The majority of space is dedicated to the research and institutional components of the program, but areas for civic functions are also included. A well designed utility infrastructure is essential to achieving a sustainable development. Integration of the project’s goals for land use, land pattern development, transportation, and energy efficiency were thoroughly considered. 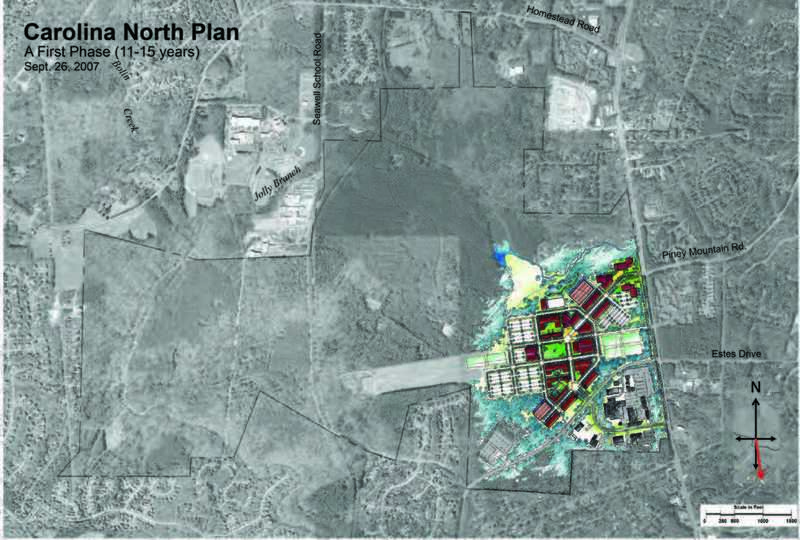 Central energy production and reclaimed water facilities were considered critical to building Carolina North as a sustainable development. Centralized utility facilities can reduce potable water consumption and carbon footprint compared to distributed production at individual buildings. The plan anticipates integrated facilities to support all programs with a framework of infrastructure that can mature with the campus. This holistic approach enables the campus to operate efficiently from the outset. 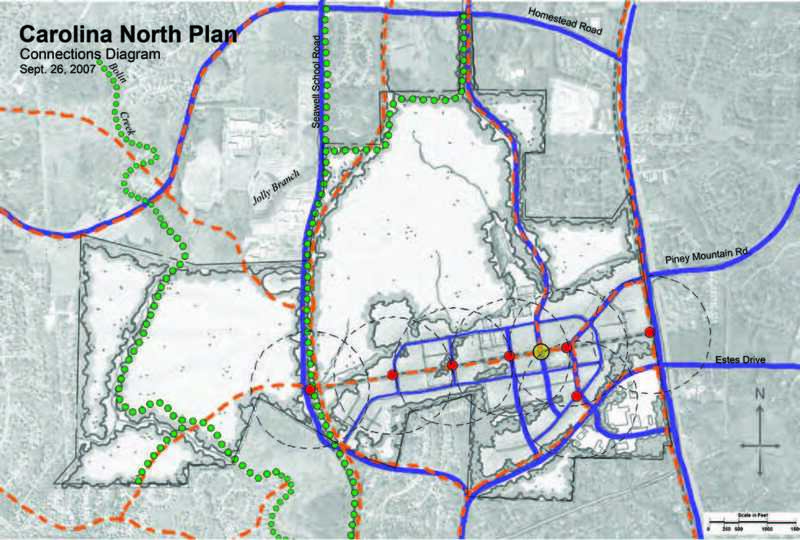 The plan locates a major utility corridor under the transit spine within an accessible tunnel. The tunnel will contain many of the main runs of the required utility systems. Smaller, direct-buried utility lines and piping are located under many of the streets to serve all buildings and loop back to the tunnel. Implementation phasing and actual building system needs will play a large role in the timing and placement of this infrastructure. 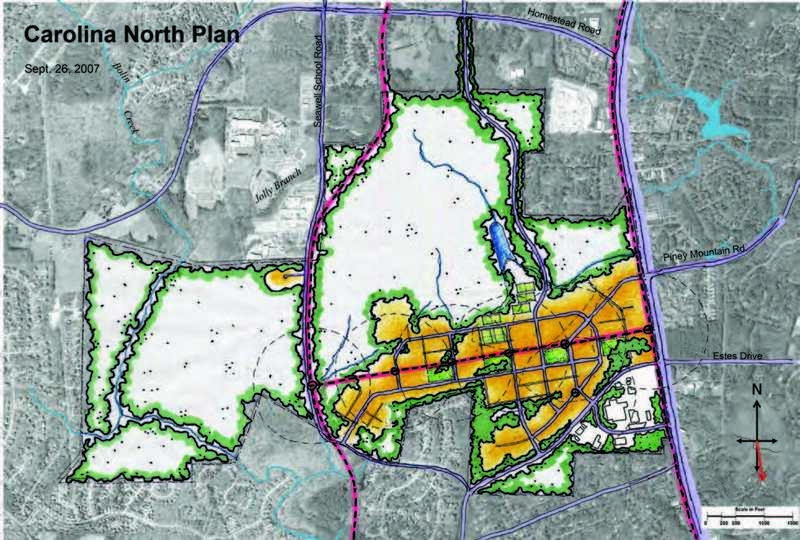 The Carolina North Plan depicts a potential development build out. Red boxes diagrammatically represent possible building footprints and their setbacks. These images illustrate how the campus could evolve, but the plan allows for long-term flexibility in implementation phasing. 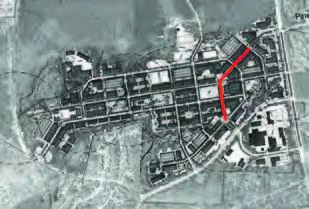 The development is focused in an east-west orientation aligning with the existing airport runway. This keeps the majority of the development within the previously disturbed land and integrates solar south orientation. The regular pattern of central open spaces acts as an organizing element and brings more working and natural landscape into the developed core. The integrated transit system and the east-west organization allow for nearly all of the development to be located within walking distance to the transit nodes. The development is compact, making pedestrian and bicycle travel easy, and retains a large amount of existing forest habitat. design for efficient land use with appropriate density. The cross-sections illustrate typical streets with transportation, landscape, stormwater, and utilities infra-structure systems. Each cross-section represents a general section for a particular area of the development. Buildings, open space, transit, parking, stormwater management, utility infrastructure, and energy technologies were integrated at a conceptual level. These sections show the interconnection of elements that form a sustainable development.